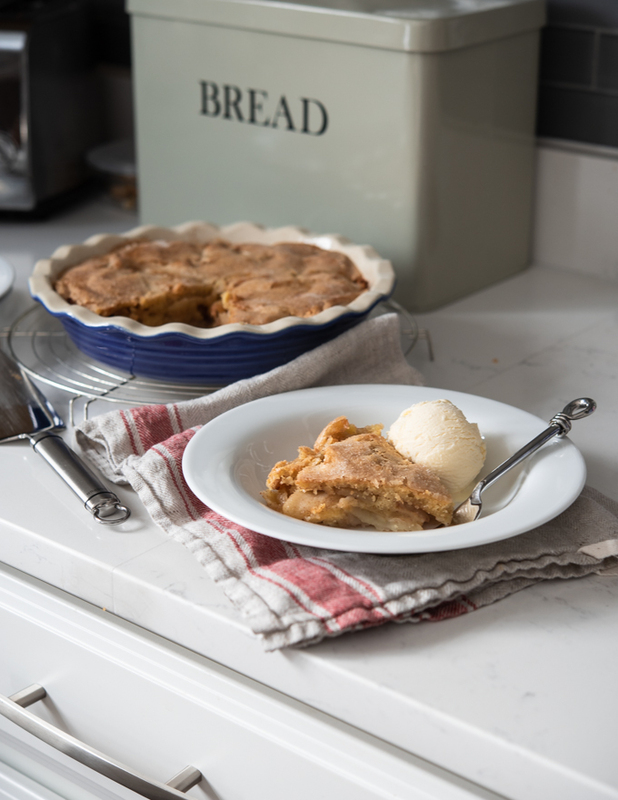 If you like an homemade apple pie but doesn’t like all the work you have to do to make the homemade pie crust, this easy no-crust apple pie recipe is the best solution for you. 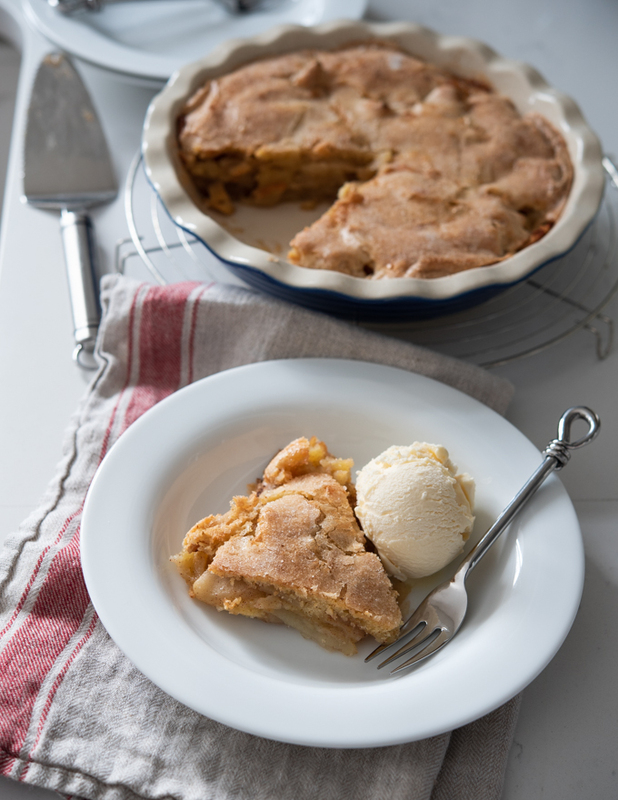 Apple pie is one of my favorite winter dessert. but unfortunately, I don’t get to make that often due to the hassles of making a pie crust. I provably make an apple pie once a year for the Thanksgiving feast. Apple pie is such a comfort dessert, I should make it more often. Of curse, I can use the store-bought remade pie crust, but you can’t beat the taste of homemade crust. 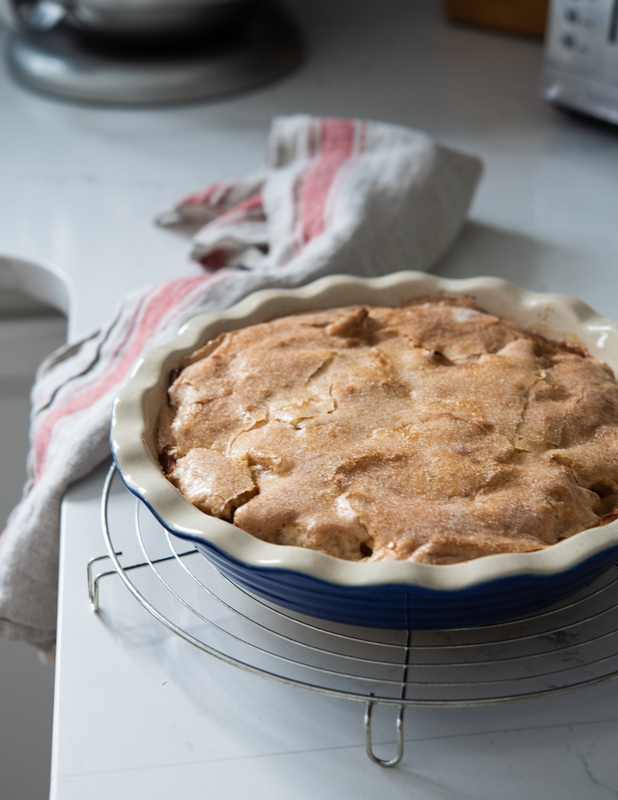 This recipe for no-crust apple pie is super easy and quick. You only need about 10-15 minutes of time to assemble the pie before you put it in the hot oven to bake up. 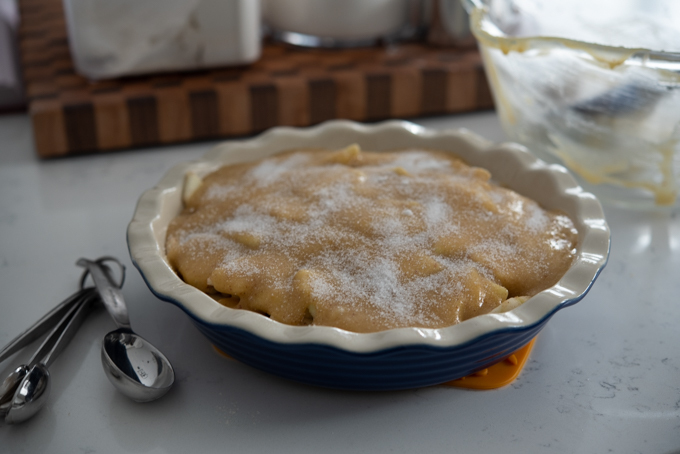 All you need to do is to peel and dice the apples, and whip up a very simple batter to top the mounds of apple slices, and that will mimic the crust. You don’t have to roll out the crust anymore. 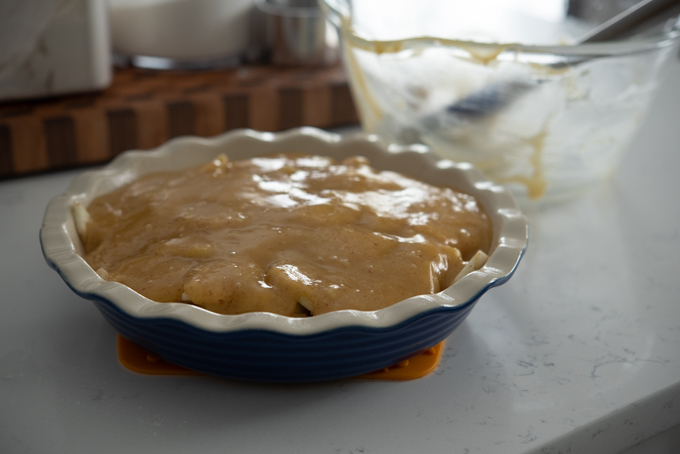 The batter will turn into flaky soft crust that has a texture of between a pie crust and cookie. I like how the brown butter adds a nice aroma to the crust. Serve this pie warm with a scoop of vanilla ice-cream. You will be in heaven! Peel, core, and slice the apples. Toss them with 2 tbsp of sugar, lemon juice, and cinnamon. 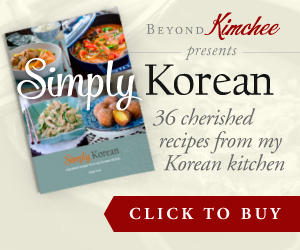 Pile them in a 9-inch pie pan. Melt the unsalted butter over medium heat and let it brown, but not to burn. The butter can go golden brown to burn in seconds so watch carefully. You will want your butter to be deep golden brown. Transfer the browned butter into a large mixing bowl. Add sugar and mix well. This will lower the temperature of butter a little. 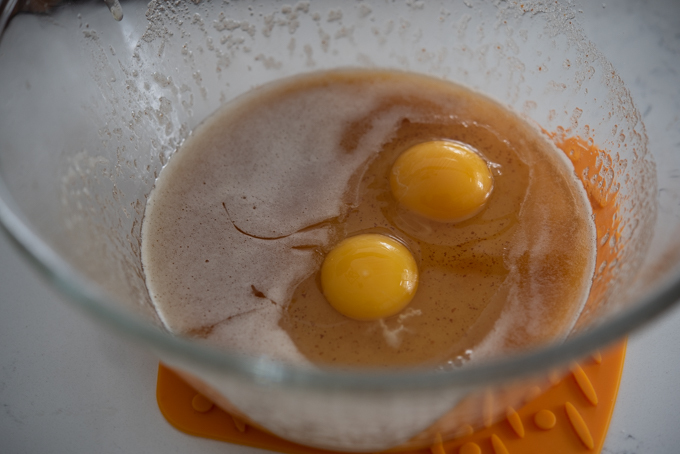 Add the eggs and mix again to incorporate. 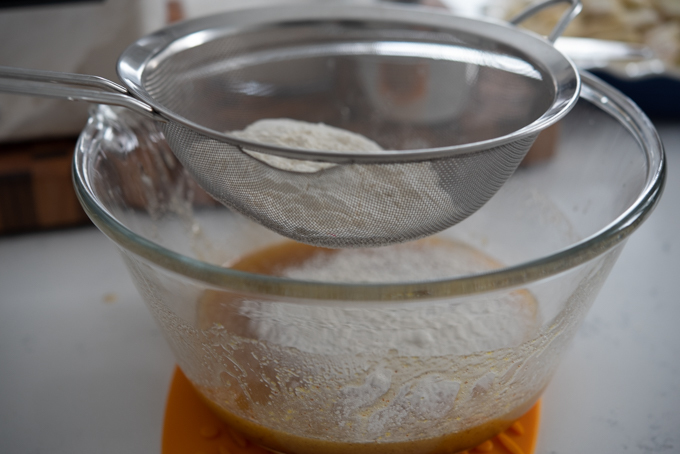 Sift the flour over a fine mesh and add to the butter egg mixture. Mix well. Pour over the apple slices. Sprinkle 1 tablespoon of sugar on top to give a slight crunchiness to the crust. Bake the pie in the preheated oven for 40-50 minutes until you see some cracks on the surface. I used the convection oven and I think that helps the crack to be more obvious. If your oven is convention or gas, the crack might not show but you will still have flaky crust to enjoy. 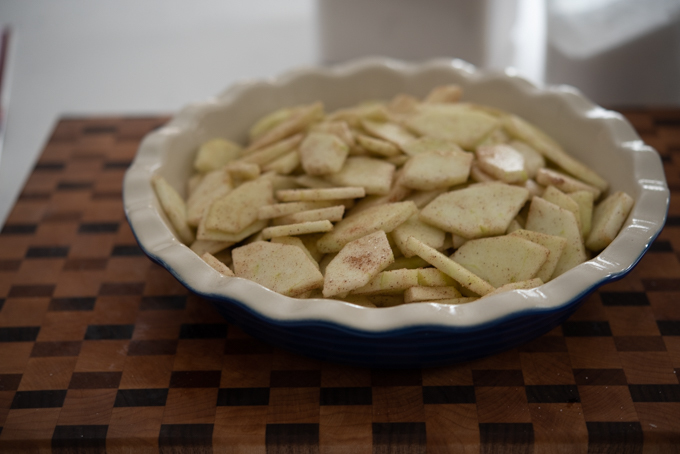 Mix apple slices with lemon juice, 2 tablespoon of sugar, and cinnamon; toss well and put them on a 9-inch pie dish. 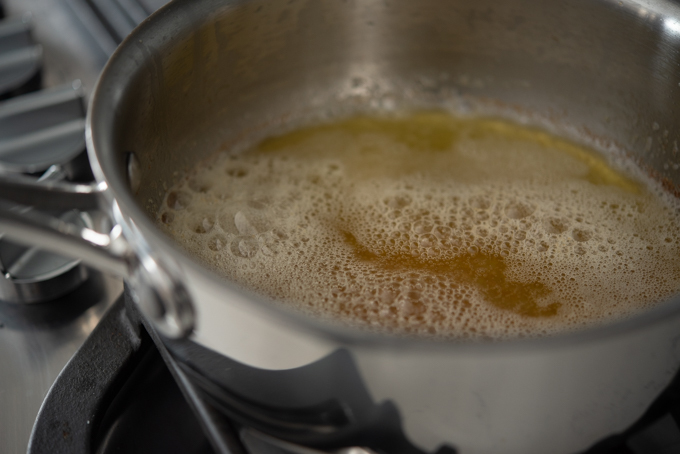 Melt the butter in a small saucepan over medium heat and let the butter brown to be deep golden brown, about 5 minutes. Pour the browned butter into a large mixing bowl. Add the 3/4 cup sugar and mix well. The sugar will not dissolve very well and it is okay. Add the eggs and stir to combine. Sift the flour in a fine mesh and add to the butter egg mixture. Stir well to combine. Le nth pie cool on a wire rack for 5 minutes. Serve the pie warm with a scoop of vanilla ice-cream. I love fuss free and delicious desserts like this! Yummy! how to make this cake tobe much.coz iwanna make it for my big family?